It is the color of high energy, enthusiasm, hope, fun, and cheerfulness. So stop thinking that if you offer a person a large bouquet of yellow flowers it means jealousy. It will only mean a great joy and will definitely brighten the day of that person, with such beautiful yellow flowers. A person that likes and picks the yellow color is a very communicative person, which also enjoys a challenge. He is dynamic, but also very calculated, not making any step further until a full analysis of the situation is made. But these persons are not sober at all, even if they look like scientists sometimes. They are fun, entertaining, real living clowns. It is always great to have them around since they can brighten your day and make you laugh. Although, yellow can also induce states of anxiety because it is considered to be such a rapid moving color. Because it influences analytical thinking, a person may start to be too critical, regarding his person and others that are around as well. Yellow is also a self-depending color, not being connected to emotional feelings. So an individual, which is already to rational and logical, may not be able to get involved at an emotional level. The color also give an elevated sense about our person and the way others see us from the outside. It feeds the ego and self-esteem. 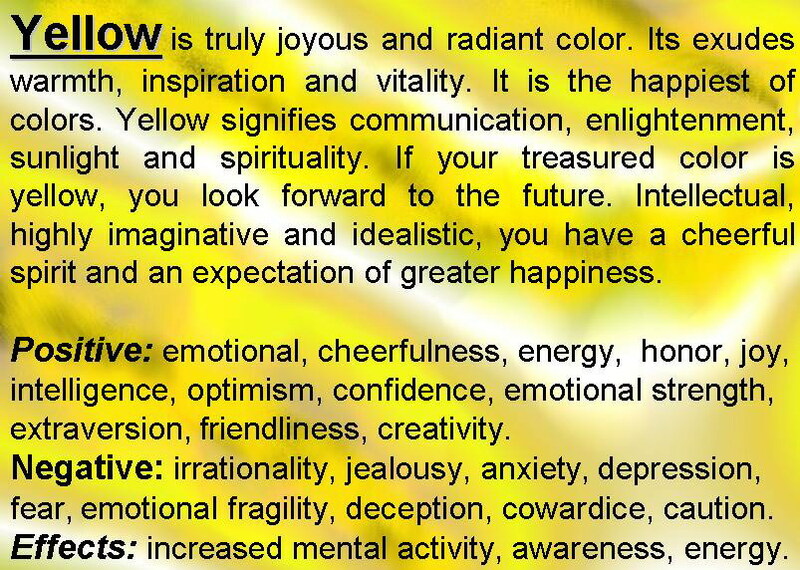 Among the positive traits given by the yellow color are optimism, enthusiasm, confidence, originality, wisdom, analytical thinking, creativity, fun. But the color also have negative traits, of can be mentioned the following: critical, impatient, impulsive, egoist, pessimist, with complexes, cowardly, cold from the emotional point of view. The various shades of yellow also have their benefits, or not. For instance, bright yellow is great for clearing up the mind. A lemon yellow means a need for order in life. Citrine yellow stands for emotional instability and deceptions, as it will never take on serious responsibilities. Golden yellow, more sensitive to criticism, it represents curiosity and the attraction towards investigations. A cream yellow encourages the creation of new ideas. But if the color is too faded it might mean lack of confidence. Dark yellow, the color of the cynic and complainer, represents the presence of melancholy, lack of love and even depression. I am using Red because I think red “s bold” and I think it will stand out and its very pretty.